California is America’s mega-state; the population is higher than that of Canada. However, the desire for a safe community is one thing that unites the nearly 40 million people who call the Golden State home. The ValuePenguin team analyzed the most recent FBI Crime Report to rank cities in California for safety. Overall, the 417 cities in this study had populations of at least 5,000 and crime scores that ranged from 168 to 7,626. The top five consists of a diverse set of cities. The score takes into account violent and property crime and adjusts it for population size. For more information, you can review the complete report to find out which cities are doing great and which ones have room for improvement. These cities have an average crime score of 317, which is 81% lower than their typical peer in the state. With some of its lowest total violent crime rates, these five are the safest places in the state. This small city is not only the safest place, Imperial is the only community with a final crime score below 200. It had the lowest rate of property crime of any California city in this study. This middle-class community, where the median household income was $12,000 above the median for California, is located in Imperial County which borders Mexico. It boasts of its family-friendly environment, and the police department advises parents to "Look Before They Lock" to prevent heatstroke deaths from kids being left in cars. This mid-sized city has a population of just under 50,000 and is located in Orange County. Rancho Santa Margarita had the second-lowest rate of property crime in this research. The Orange County Sheriff’s Department handles law enforcement for this community. Rancho Santa Margarita’s median household income was $43,000 above the state’s median household income, and almost half of the residents over 25 years of age had at least a bachelor’s degree. Laguna Woods is a small city (population of 16,480) that had only six violent crimes in 2014. The city also has the fourth-lowest rate of property crime. It is 16 minutes south of Irvine and eight minutes from Mission Viejo in Orange County. Laguna Woods has a large population of senior citizens, almost 80% of its population is over 65 years of age (compared to just over 11% of Californians). This fact explains why the community’s median household income was below the state’s. Number four on our list is a small community that is a 25-minute drive from San Jose. In addition to a low rate of property crime, it had the fifth-lowest rate of violent crime. Los Altos Hills is in Santa Clara County, and the Sheriff’s Office works with Los Altos Hills residents who want to make their homes safer. This community is very affluent; it had a median household income of over $224,000 per year and high home values. This very small community, with a population of just over 5,000, comes in at number five. It only had two violent crimes reported in the year surveyed. Kensington encourages a strong relationship between its police department and citizens by offering a Citizen’s Academy where people meet the chief of police and learn about law enforcement topics. This town is a 12-minute drive from Berkeley and approximately a 40-minute drive from San Francisco. It is another affluent community where the median household income was more than double the median household income for the state. Below is the entire list of places that we included in our “Safest Places in California” study. They are listed from the safest to the least safe, according to our analysis. The calculation for the crime scores can be found in the methodology section below. Take a look at the graph and see where your hometown ranks. People want a consistently safe place when determining where to live. This year’s number one city, Imperial, was number two overall last year. 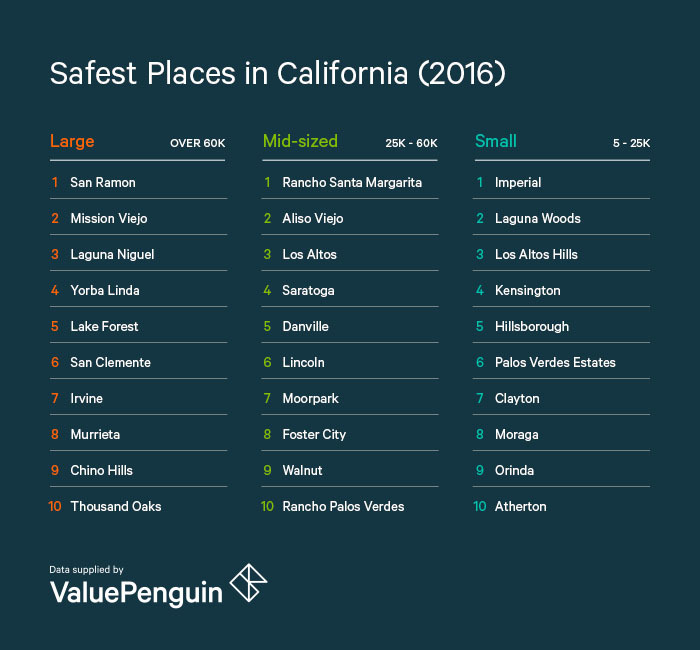 Rancho Santa Margarita made ValuePenguin’s top five and was the safest mid-sized city two years in a row. Even though Hillsborough, last year’s number one place, barely missed the top five, it had the lowest rate of violent crime in this year’s study and zero violent crimes overall reported in last year’s analysis. In both ValuePenguin’s 2015 and 2016 research, small communities (under 25,000 population) dominated the top five. However, small does not always mean safer. This year’s least safest community was also from the small category. The ValuePenguin team changed the parameters of the size categories slightly from 2015 to 2016 to ensure an even distribution of cities. However, there were still consistent results. Nine out of the ten safest large cities in 2015 showed up in either the mid-sized or large cities category this year. You can compare all categories for yourself here.